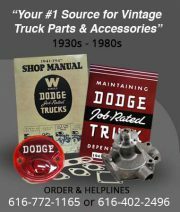 We have been collecting Dodge and Plymouth trucks and parts for many years. We stock complete project trucks, used parts, and new reproduction parts from the 1930’s to the 1980’s. We could possibly help you with other years also. We also recondition parts such as gas tanks, speedometers, gauges, stainless trim, etc.